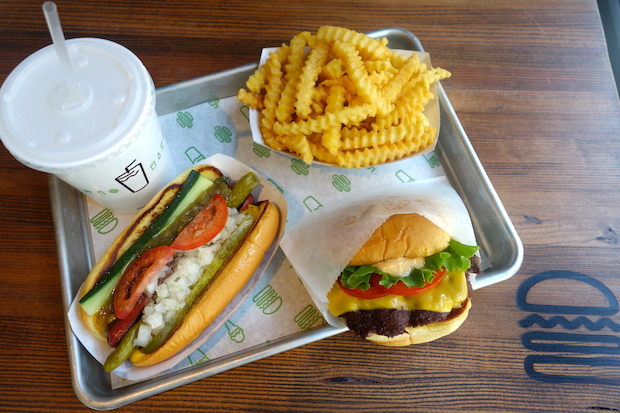 RIVER NORTH — This time Tuesday, you could be grabbing lunch at Chicago's first Shake Shack. The New York-based burger joint's first-ever Midwestern outpost will open at 11 a.m. Tuesday at 66 E. Ohio St., and will feature unique menu items that incorporate standouts from local restaurants and bakeries. The restaurant chain's signature extra-thick milkshakes, which they call "concretes," will include the Shack Attack, made with chocolate custard, chocolate truffle cookie dough and Vosges black salt caramel chocolate; Da S'mores, a vanilla and chocolate custard swirl made with s'mores pie from Bang Bang Pie Shop; and the Salted Carame'L' that includes a Glazed & Infused salted caramel old-fashioned doughnut. Perhaps even more Chicago than the "Shack-cago" hot dog available at all Shake Shack locations will be the exclusive Publican-sourced pork sausage, which is topped with cheddar and American cheese sauce and crispy ale-marinated fried shallots. “Thirteen years ago, we created a humble hot dog cart in New York City, selling Chicago-style hot dogs to support the renovation of Madison Square Park," Shake Shack CEO Randy Garutti said in a release. "It’s only fitting that we finally made it to Chicago," Garutti said. "River North is such a robust, thriving neighborhood with great restaurants and hotels, and our neighbors have already been so welcoming." The beloved restaurant chain first opened in Madison Square Park in 2004, and has since expanded across New York City and beyond, with outposts in Miami, Washington, D.C., and Philadelphia. Shake Shack is part of the Union Square Hospitality Group, a collection of restaurants owned and operated by restaurateur Danny Meyer that includes The Modern and Gramercy Tavern in New York. Meyer's family "hails originally from Chicago and St. Louis," according to a release from the company, and the restaurant group owner called the opening a welcome return to his roots. The River North location will also serve beer, including local favorites Goose Island 312 Urban Wheat, Revolution Anti-Hero IPA, and Brickstone Cherry Ale, part of a rotating drink menu. The restaurant will be open daily from 11 a.m. to 11 p.m. Check out the full menu here.